Click the button below to add the RED RIOT! Boys Gymnastics Leotard/Unitard: Red, Yellow - FREE SHIPPING! to your wish list. The new Red Riot boys gymnastics leotard/unitard is here! 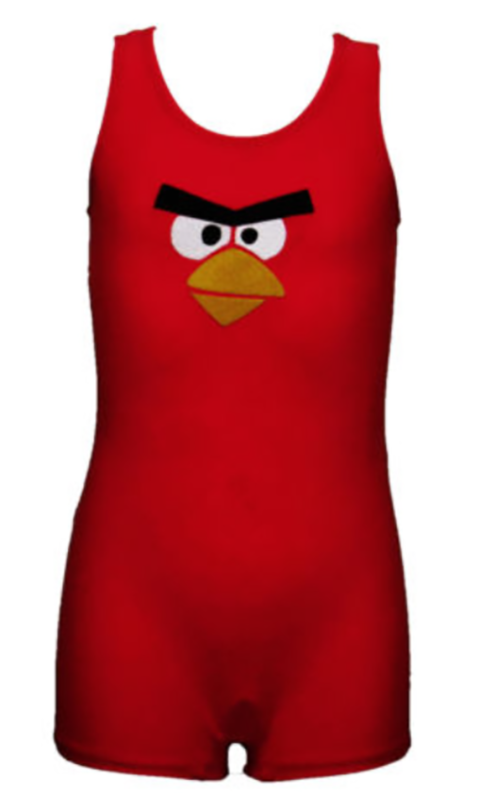 This striking red leotard/unitard with scowling bird eyes will get everyone's attention. This statement-making gymnastics unitard is designed to meet the highest quality and performance standards. Each unitard provides exceptional comfort and durability. Every genuine Red Riot gymnastics unitard is hand-stitched in the USA featuring rich craftsmanship and precision detailing. Each unitard is made from the lightest, highest-quality nylon spandex 4-way stretch material. This material can be stretched repeatedly while maintaining most of its original size and shape. The eye-catching design of this stunning unitard will give every super gymnast an unbeatable combination of confidence, comfort and pride. Also makes a great gift. Order your Red Riot gymnastics leotard/unitard today! My kids love it, it's a nice tight material but stretches, so I got a children's extra small, hoping to fit perfect on my 3 year olds and just a little loose on my almost 2 year and it does! I can't wait to buy more!